NOTE: In the fourth paragraph of this review, there is one sentence that could be construed as a spoiler. Because I didn’t feel like it merited one of my normal big, categorized “SPOILER WARNING” disclaimers, I have simply set the offending text to be blacked out until you highlight it. It’s funny how these things happen sometimes. It has now been just over twelve hours since I watched Mark Raso’s film Copenhagen, and I am continually failing to bring up roughly sixty percent of the movie at all to my memory. It comes, it plays, and it vanishes into thin air, with only a few universally good (or bad) remnants that bear any particular memory. What I do remember is that it loyally follows the structure of the coming of age movie, with the major bend in the rules being that the main character is twenty-eight years old. Another thing I remember is that there are some strong performances in it, and one in particular that was especially extraordinary. Another thing I remember is that it serves less as a character study than as further convincement that Copenhagen seems like a really nice city. That twenty-eight year old I mentioned is named William, and he is played by Gethin Anthony (Game of Thrones viewers, I am told, may know him for playing Renly Baratheon, however briefly. He is also on Aquarius, where he plays Charles Manson — an alternate, handsome version, that is. But I’m getting off topic here). He certainly has a strong screen presence. However, the thing for Anthony is that in Copenhagen, his screen presence for a good chunk of the movie is for him to play a crass, narcissistic, womanizing, and thoroughly unpleasant New Yorker, travelling across Europe with his friend Jeremy (Sebastian Armesto), who brought along his girlfriend Jen (Olivia Grant). When his companions leave him, as a result of his crassness and narcissism, William finds himself alone in Copenhagen, with the goal of this trip set securely in mind. You see, his dad was Danish, and he walked out on the family when his son was fourteen. William, when looking through the belongings of his now-deceased old man, found an old letter, sloppily written in Danish, from his father, addressed to his grandfather. It was never sent, but now there is opportunity to change that, presuming that a) his grandfather is still alive, and b) William can find him. This would seem like an impossible task had our protagonist not met a local waitress named Effy (Frederikke Dahl Hansen), all of fourteen years old but with a deliberate personality which trumps old Will in a heartbeat. She knows Danish, and he knows the loose ends in his heritage that he needs to tie up. Maybe along the way, he’ll learn to be more compassionate. Maybe. Copenhagen starts out as a tired road trip setup, moves into a fictitious, low-stakes variant of something like Who Do You Think You Are?, which proves to be the most compelling, but sadly the part of the film least devoted to, and makes an underlying-but-not-subtle pass at a continual game of Will They Or Won’t They between our two leads, which would be fine had the character of Effy not been fourteen years old. While the age of consent in Denmark is fifteen, and Hansen was nineteen during filming (she thankfully doesn’t look concerningly young either), and the point is to show how William is able to see women in a less degrading light than he had at the start of the film, there is a kind of oozy, uncomfortable ick factor that surrounds some portions of the 98 minute movie. Some of it seems intentional for the purpose of adding conflict and suspense, which is OK, but other parts, quite honestly, could not have been. And to the film’s moralistic credit, when it comes to the question of Will They Or Won’t They, the answer is Won’t. But my own individualistic qualms aside, I must say that Hansen is absolutely astonishing as Effy. Her performance is uniquely real, with personality traits and behavioral tics coming through that seem nearly identical to people I know in real life, and portrayed with a startling realism. The character is strong willed and independent, and with a shaky home life, she has to be. Hansen and writer/director Raso work in tandem here, and they create a full-blooded person. Less can be said about William. He is the main character, yet spends most of the film largely settled in one of two binary traits: selfish jerk or mopey introspector. Anthony certainly does a good job at making sure the character doesn’t fall completely flat, but I only wish the script dedicated as much to him as it did to Effy. Going back to the opening of this review, when your protagonist is significantly underdeveloped in comparison to someone else, you tend to forget many of the things you should have remembered. 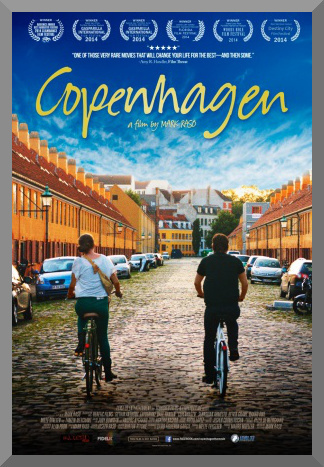 Copenhagen certainly has some good qualities besides Hansen’s performance — the cinematography beautifully shows off its titular city, and there are some agreeable messages within about coping with hard details of your past but not being relegated to them. The problem is that in contrast to the work spent on spinning Effy into the spotlight of the film the character is, the cracks in the development of the others, William especially, begin to become more prominent, to the point where I was no longer watching the movie as I was supposed to, but instead wondering why we couldn’t have another one told from Effy’s point of view instead.